This is my first attempt at writing an AAR (After Action Report), a genre that turns gameplay into prose. AARs come in all shapes and sizes – from epic to terse and everything in between – but this one will lean heavily towards the unpretentious and comedic. It will be cross-posted here and on the Paradox forums if the reception is kind. This is Örvar, first of the House of Koss. He has a beard, a county and no family. Don’t ask him about that last bit, it gets really awkward. Örvar wants to make a name for himself. In fact he already has: Koss. Before he was made a count, he was just ‘that guy Örvar’. Or – he gets angry just thinking about it – Ööörvar, turning the first syllable into a retching sound. Koss. He likes the sound of it. He’s been trying to turn it into a saying that “Koss is the Boss” – as if to say ‘Koss is our leader and we trust in him’ – but so far it hasn’t caught on. 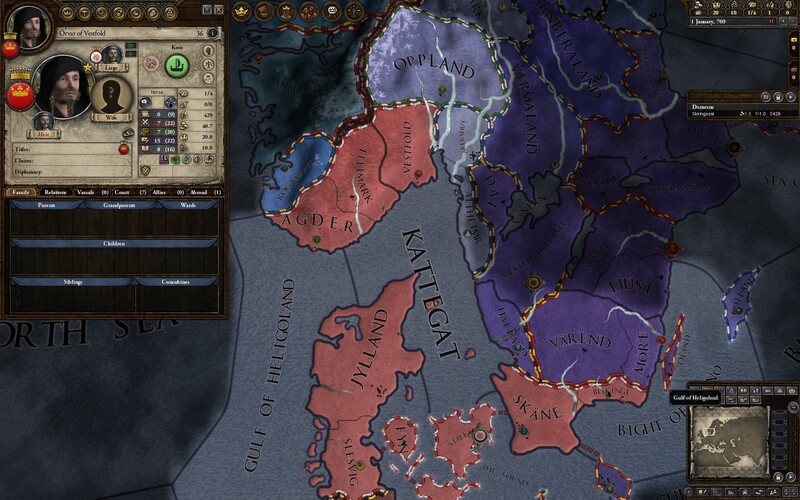 As yet another Crusader Kings 2 sale rolled around (this time apparently in celebration of the game’s three-year birthday – congrats!) 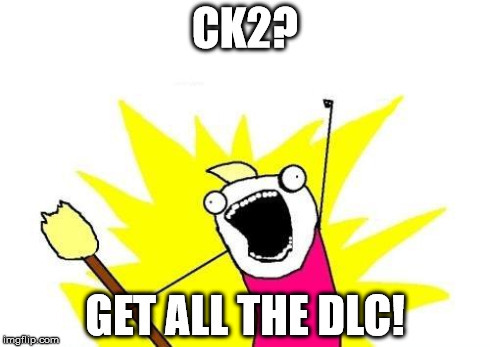 I finally scooped up the last bit of DLC with Charlemagne. And seeing how much I had saved I treated myself to some cosmetics. Cosmetic DLC like new unit models for Saxons and the like, that is. Do I have all the DLC? No but so close it makes no difference. Iberians is where I draw the completely arbitrary line for some reason. This isn’t really meant to be a rumination on the ethics of Paradox’s DLC policy regarding CK2. It is meant as a celebration that I now have a good reason to start a fresh CK2 campaign all the way back in the 8th century. With chroniclers tracking my every move, with fresh faces, new old clothes and an abundance of ‘historically accurate’ dynasty shields. It’s going to be great. I might even do a bit of AAR’ing of this attempt. If nothing else it should help me remeber to quit before 1 AM so I can jot down some AA thoughts. That’s usually when I start making decisions based on spite and rage. Wasn’t that also one of Machiavelli’s tips to the young Medici prince? “Layeth downe thy schemes and get thee to bed before the clocke striketh one as thy strategemizing will sucketh thereafter”? I love Psychonauts so the idea of somebody breaking it to shortcircuit all the brilliant content and finish it as quickly as possible should be horrid and unwatcheable. Except of course when that person is surrounded by the game’s creators jeering and laughing at the breaking and the short circuiting. This is a measure of how much I love Tim Schaefer: I’m actually jealous of the guy being (jokingly) passive-aggresived by him. Apologies for the title. 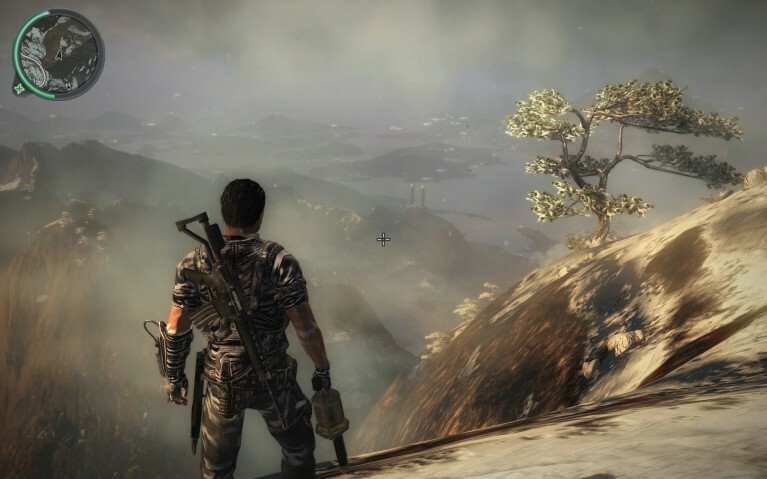 It’s geting late and something like ‘JC2 – thoughts on’ or ‘retrospective’ or ‘post play analysis’ sounded way too serious for something as frivolous as Just Cause 2. I finished the game over the weekend, having completed all faction and agency missions. It has been quite a ride. However when rolling down a highway in a tank shooting up all the traffic just to see if anybody will stop you only provokes ennui… well, in the words of Just Cause 2 anonymous bark #126: “It’s time to end this!” Here are some my final thoughts on the game in the hope that I can stop playing now. At 55% completion. I know that the rest is just busywork. Who needs that? Right?